Around 30,000 residents in two council wards are to be asked whether they support the idea of introducing 20mph speed limits in their neighbourhoods. The council is consulting local people in Balham’s Bedford ward and Furzedown ward in Tooting to ask them if they want a lower speed limit to cover their areas. Residents living on the large Dover House Road estate in west Putney have had a 20mph zone for three years and councillors are keen to let more local people have a say on whether they want 20mph zones where they live. Informal consultations are also being held with residents living in parts of Fairfield and East Putney wards. “This is localism and local democracy in action. We are saying to people across the borough ‘do you want a 20mph limit in your neighbourhood’. If enough people support that idea, then we will implement it. What we do not favour is making changes like this on a blanket basis without consulting people and asking them for their views.
" Informal consultations ! What is this ? Transport spokesman for the council, Councillor Russell King, says, "This is localism and local democracy in action. We are saying to people across the borough 'do you want a 20mph limit in your neighbourhood'. If enough people support that idea, then we will implement it. What we do not favour is making changes like this on a blanket basis without consulting people and asking them for their views". Meanwhile in Furzedown and Bedford ward areas, where support amounted to only 27% and 12% respectively, a budget of £121,000 has been set aside for implementation in 2013/14. "Wandsworth Borough Council received petitions from residents of the following roads for the introduction of a 20 mph speed limit, similar to that operated in West Putney for several years. 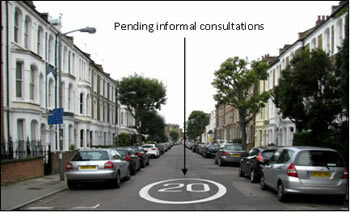 Support for the speed limit was convincing in Norroy, Disraeli and Fawe Park Roads, see box, and yet the council has decided to conduct “informal” consultations, with no time frame or budget for implementation". "Clearly, localism and local democracy moves slowly, hardly action at all".